Hundreds of protestors gathered in Tori Stafford’s hometown Saturday, to push back against the transfer of one of her killers to an indigenous prison healing lodge. 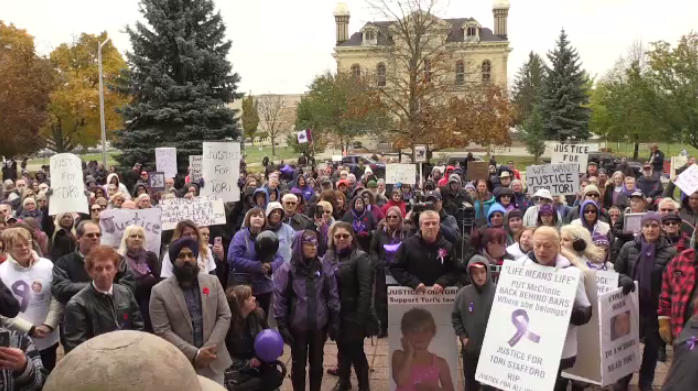 Members of Stafford’s family and others from her hometown gathered at the Woodstock courthouse, pushing to put Terri-Lynne McClintic back in a maximum security facility and to change federal law. “It would mean life in prison for convicted murderers,” says a rally organizer Melissa Streatch. At 8-years-old Tori was kidnapped, raped, tortured and murdered by Terri-Lynne McClintic and Michael Rafferty. McClintic pleaded guilty to first degree murder. Less than 10 years into her sentence she was transferred to an indigenous prison healing lodge. “She should be behind bars for life like the judge told us she was going to be,” says Ernie Hardman, the MPP for Oxford. The public safety minister, Ralph Goodale said Friday he has received a report he requested from correctional services of Canada on how and why this transfer occurred. “We all want this system to be as good as it can possibly be for the protection of the public,” says Goodale. The report is expected to be made public soon.